August 14, 2012 - More forest fires in the western United States have prompted the U.S. Forest Service to call in two additional C-130 Hercules aircraft equipped with the Mobile Airborne Fire Fighting System. The versatile airframe has found uses in a variety of other roles, including as a gunship (AC-130), for airborne assault, search and rescue, scientific research support, weather reconnaissance, aerial refueling, maritime patrol and aerial firefighting. It is now the main tactical airlifter for many military forces worldwide. Those aircraft, expected to be operating will come from the Wyoming Air National Guard's 153rd Airlift Wing here, officials said. "This has been an interesting fire season for us," said Air Force Col. Jerry Champlin, 153rd Air Expeditionary Group commander. "Our operations have waxed and waned since we were activated June 25. Our aircraft are heavily engaged, and having two additional MAFFS will definitely help." 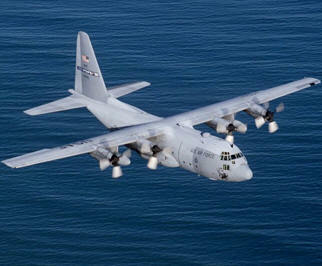 Under the modified request for assistance received Aug. 11, the 153rd Airlift Wing's two C-130s will join Air Force Reserve Command C-130s from the 302nd Airlift Wing operating from Boise Air Terminal in Idaho. A C-130 from the California Air National Guard's 146th Airlift Wing and another from the North Carolina Air National Guard's 145th Airlift Wing will operate from McClellan Air Tanker Base in Sacramento, Calif. This year's MAFFS operations have dropped more gallons of fire retardant than during the last nine fire seasons, officials said. MAFFS is a joint Defense Department and U.S. Forest Service program designed to provide additional aerial firefighting resources when commercial and private air tankers are no longer able to meet the Forest Service's needs. MAFFS is a self-contained aerial firefighting system owned by the Forest Service that can discharge 3,000 gallons of water or fire retardant in less than five seconds, covering an area one-quarter of a mile long by 100 feet wide. Once the load is discharged, the system can be refilled in less than 12 minutes.